All Internet Content Providers are covered either under the Class Licence in Section 9 of the Broadcasting Act or under the new Individual Licence in Section 8 of the Broadcasting Act. Some of those under the Class Licence may need to register with the MDA. The new website "The Independent" is one of those sites required to register. Below is some background information provided by MDA on the licensing framework. Under the Class Licence scheme enacted under Section 9 of the Broadcasting Act (BA), all Internet Content Providers (ICPs)* are automatically class-licensed and must comply with the Class Licence conditions and the Internet Code of Practice. days after the commencement of its service, or within such longer time as the Authority may permit. Furthermore, if required by the Authority to do so by notice in writing, (a) an Internet Content Provider who is, or is determined by the Authority to be, in the business of providing through the Internet an on-line newspaper for a subscription fee or other consideration; and (b) an Internet Content Provider who is, or is determined by the Authority to be an individual providing any programme, for the propagation, promotion or discussion of political or religious issues relating to Singapore shall register with the Authority within the time stipulated by the Authority in the notice. So far, MDA has not required ICPs in the business of providing subscription-based newspapers to register with the Authority. From 1 June 2013, websites which report regularly on news and current affairs in Singapore and enjoy significant reach among Singaporeans will no longer be class-licensed. Instead, MDA will require that they be individually licensed. 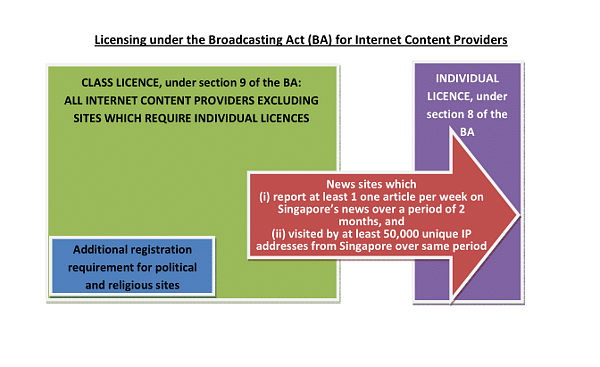 Under paragraph 3A of the Broadcasting (Class Licence) Notification, sites which (i) report an average of at least one article per week on Singapore’s news and current affairs over a period of two months, and (ii) are visited by at least 50,000 unique IP addresses from Singapore each month over a period of two months and are notified by the MDA will require an individual licence.